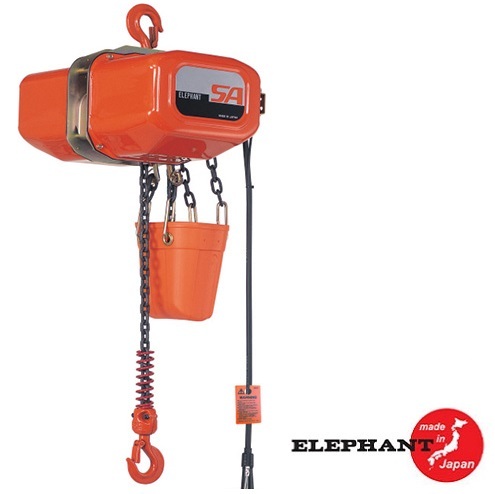 The Elephant Lifting SA Series hoist is a single-speed, single-phase electric chain hoist with a hook mount, and a 0.61-horsepower insulated motor with a 115V/60Hz power input. It is fully enclosed within a powder-coated steel plate housing that is suitable for indoor or outdoor applications, has a 10' lift, a 13.5 feet per minute (fpm) lift speed, and a 1100 lb. lift capacity. The hoist's motor is insulated to resist heat damage and has an electronic thermal protector that senses an increase in the motor's temperature, or if it has run too long, and shuts the motor off until fully cooled. The plug-in cord on this hoist is designed to connect to the MTS series motorized hoist trolley (sold separately) without requiring electrical work for plug-and-play mobility.